Provision Packs is an outreach that fills backpacks with well rounded meals, cooking instructions and hygiene items to the children of our local community. 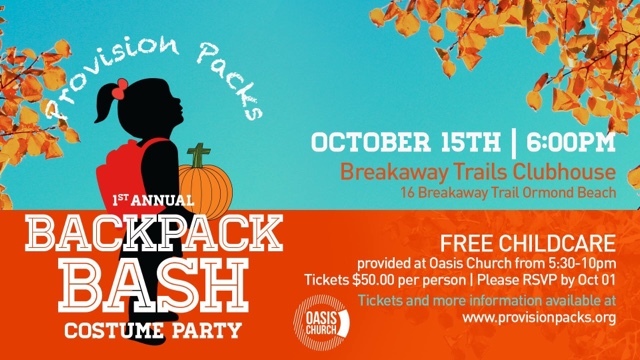 October 15 will be an exciting day for Provision Packs as we will be hosting our first annual Provision Packs Fall Backpack Bash! This will be a fun costume fundraiser including a silent auction, donated food from local establishments, and a costume contest for our 150 guests. We are reaching out to local businesses to help us raise money to feed the hungry children right in our community. 100% of all the money raised goes directly to the purchase of food here in Ormond Beach.